This Mini Ring passes through some of Britain's finest architecture, including the Gas Street Basin in Birmingham, The Birmingham NIC and National Sea Life Centre, the Birmingham vintage Railway Museum. Cruise along the Grand Union Canal into rural Warwickshire where the scenery is breathtaking. 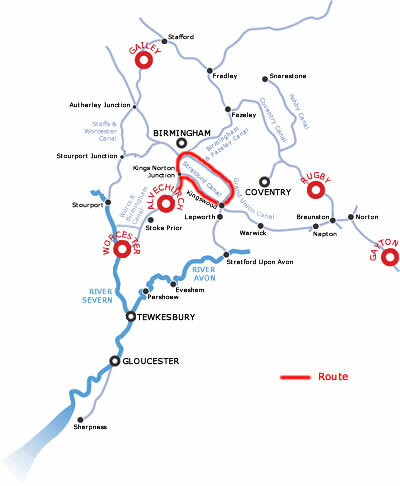 Join the Stratford upon Avon Canal back to the Worcestershire and Birmingham Canal. Cruise from the medieval village of Alvechurch with its pretty half-timbered houses. Continuing on through the Tunnel, for those with children you might want to stop at the visitor moorings at Bournville (booking is advisable), which is 1 mile north of the Kings Norton Junction. It is signposted from the canal. There is an exhibition dedicated to the history of chocolate, audio visual displays, Victorian Birmingham and a Jungle to explore! About 3 miles later you arrive at the Gas Street basin which is in the heart of Birmingham's canal network, it has been has been redeveloped into a unique experience where traditional narrow boats moor up next to cosmopolitan cafes and bars. The surrounding area is a vibrant arts and entertainment area and there are many shopping options within a short walk. Amongst some of the attractions are the National Sea Life Centre and the Jewellery QuarterDiscovery centre, also many fine Art galleries and over 500 restaurants offering every choice of food! 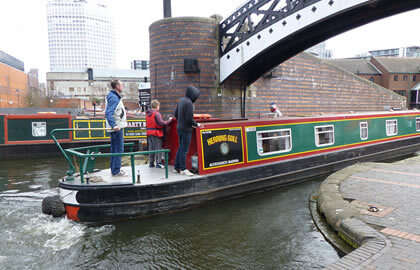 From the Gas Street basin, cruise up to the Deep cuttings Junction and turn right where you will soon encounter your first locks as you begin your descent from Birmingham, the flight of 13 locks at Farmers bridge. Turn right at the Digibeth Branch, the Ashted Flight drops through 6 locks and then left onto the Grand Union Canal. At the Bordesley Junction keep straight on do not turn left. There are 5 locks at Camp Hill. A short walk south west of Bridge 88 is the Birmingham Railway Museum, located over 7 acres on the site of a former Great Western Railway steam shed. There are 12 Steam locomotives, a Royal Mail van, a 1908 Royal saloon car and lots of steam railway paraphernalia. Www.shakespeareexpress.com. By bridge 84 there is a useful stores. Cruise on to Catherine de Barnes, a small village in the first countryside you will have seen for a day or so. There are stores and a nice pub here. Cruise down the very rural Grand Union Canal on its peaceful route southwards, passing through the 5 wide locks at Knowle until you reach the Kingswood Junction where you turn right and right again onto the Stratford upon Avon canal. You now negotiate an uphill stretch of 18 locks- the Lapworth Flight which takes you up toHockley Heath. Moor up for the night at Hockley Heath, there is a pub and stores here. Cruise from Hockley Heath along the Stratford upon Avon Canal to Kings Norton Junction. At Kings Norton Junction, turn left, very soon you will go through Wast Hills Tunnel which at 2726 yards is one of the longest in the country! An hour or so later you will arrive back at Alvechurch marina.